Just because the days are getting shorter doesn’t mean you can’t bring a little light into your life with our bright Vera Bradley colors and patterns! Find the perfect accessories to match your winter fashion this year, or search our collection for the perfect holiday gift! Our genuine Vera Bradley Carson Hobo Bag will warm up your sense of style this season with the fun and considerate designs we are known for. We took everything you loved about the Carson Hobo Bag and shrunk it down for the Mini so you can stay stylish with this slouchy sidekick! The perfect weekday-to-weekend bag. With plentiful pockets and a charging port with battery pack, this little leather purse is everything you didn’t even know you were looking for. Measuring 12.5 x 12.75 x 6.75 inches with 38.5 inch adjustable strap you can wear this Hobo Bag your way comfortably. Featuring one external side zip pocket, interior zip pocket, two slip pockets, and one charger port with battery so you can keep your phone or tablet charged on the go. Pairs perfectly with our phone cases, wristlets, and travel bags so you can complete the set or mix and match. At Vera Bradley, we believe in quality and style which is why we build our beautiful bags to keep you in lasting luxury with our Signature Collection. Our quilted cotton is colorful, lightweight, packable and (in some cases) washable. The quilted stitching sewn in tight configurations make up the classic Vera Bradley Signature Diamond Stitch, which not only adds an element of embroidered appeal and aesthetic, but also enhances the structural integrity of your favorite bag. Our products are made for long lasting convenience and style, this item can be a go-to staple for years to come. 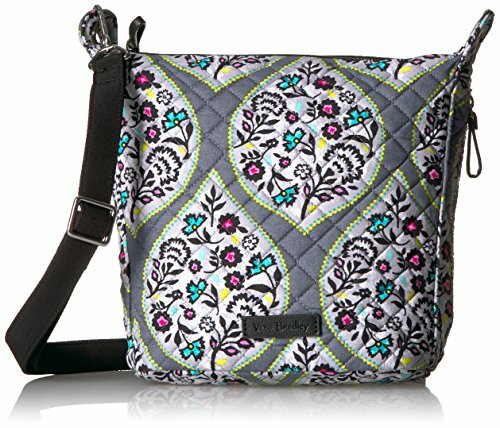 At our very core, Vera Bradley is an innovative brand for women. We’ve always been inspired by the needs of real women, and our proudest moments have been when we can bring communities of women together through their shared love of beauty. We design our products with a deep understanding of our consumer. You are the focus of all we do.